My friends and I agree that Austin is a place that will get in your blood and stay with you forever. I sure do feel grateful to call it "home" for my four years of college. This past winter break, I had the pleasure of taking one of my dearest friends from New York named Steffi around the city. We had an absolute blast and I couldn't wait to share about the trip with all of you. As a local, I had a really difficult time choosing just a few places to see in a few days. After some careful planning, we decided on the places below! 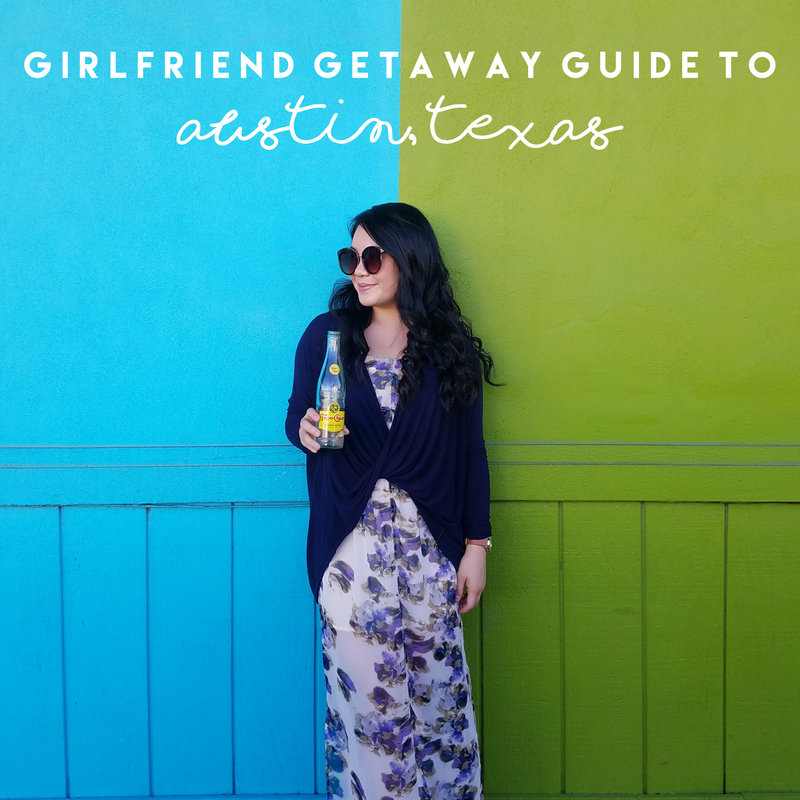 If you're coming into town for a few days and need some recommendations for what to do/see/eat and where to stay/shop on your visit, I hope this small girlfriend getaway guide to Austin helps you! 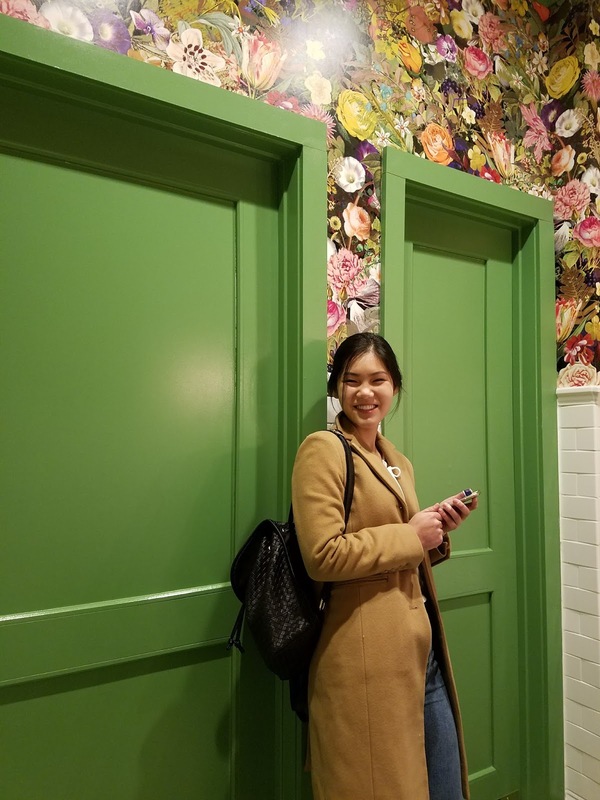 First off, Steffi and I decided to use Airbnb to book Casa Kenwood's Artistic & Airy Studio Apartment, a New-York style flat located a mile east of South Congress Street. We had the entire apartment to ourselves and it was incredibly spacious. 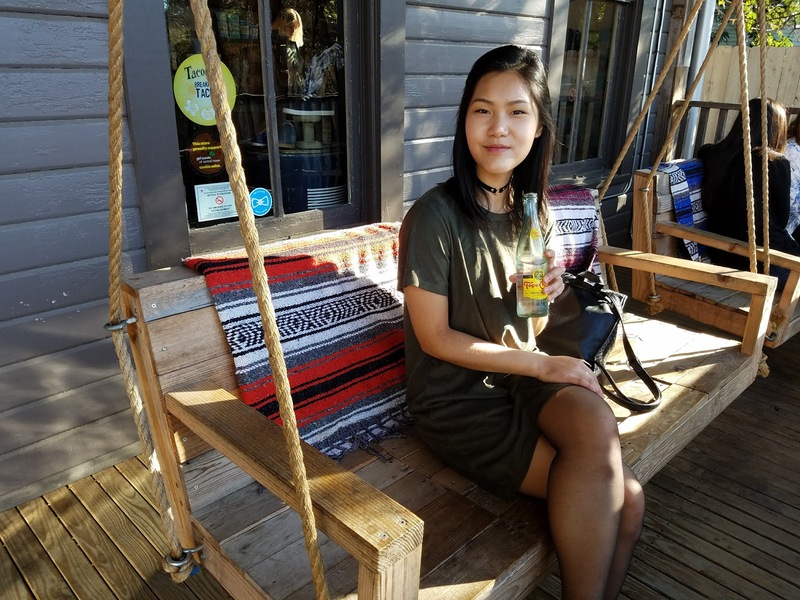 was perfect for our trip with ample room, all the amenities, and fun, eclectic quirks that made it feel very Austin. Funny story is that this apartment fits six people. With just the two of us, we had plenty of room to spread out! We adored this apartment so much, we ordered dinner in one night just to enjoy the space. Plus, the oasis of a backyard was just jaw-dropping. We booked the room for $100/night through Airbnb, so it was a steal. 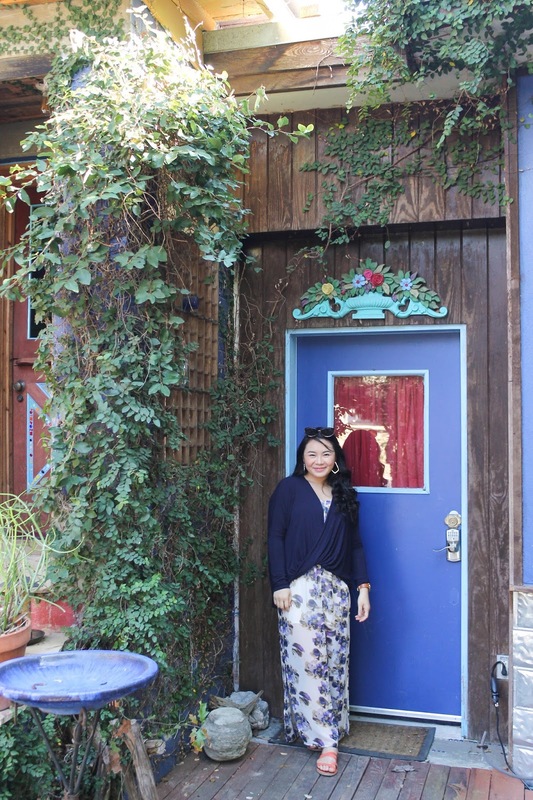 The dreamy blue door to our oasis! I say if you're on the fence about using Airbnb and you've never tried it before, give it a go! I highly recommend starting off with a space like this that most hotels can't offer. I love Airbnb and couldn't recommend it enough if you're willing to try something new. If you're interested in booking your first Airbnb, you can get your first booking for $35 off! More pictures of our place below! The living area had ample room to spread out our things. Plus, that Monet-painted dresser! All the heart eyes. It's safe to say we took an embarrassing number of photos of our abode. On to the activities during our trip! Be prepared for lots more pictures! 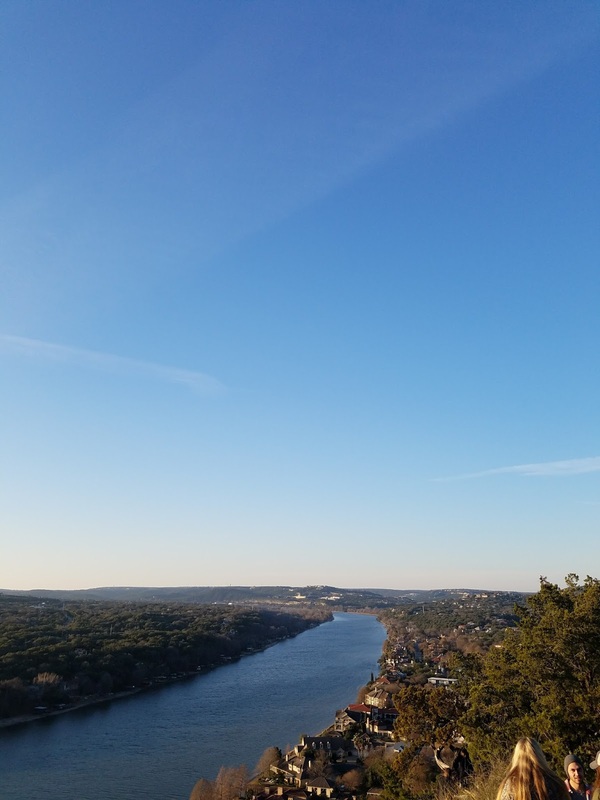 Another geology hot spot and free for visitors, Mount Bonnell also tops my list of places to take visitors. It's a small park lofted 700 feet above sea level and it's one of my favorite ways to get a great view of the city at sunset. Just be careful climbing up the stairs backing out of the tight parking spaces. After taking some pictures and exploring the Clarksville area, we decided to stop by Domain Northside. There are plenty of stores around and it makes for a great walking area on the weekend. 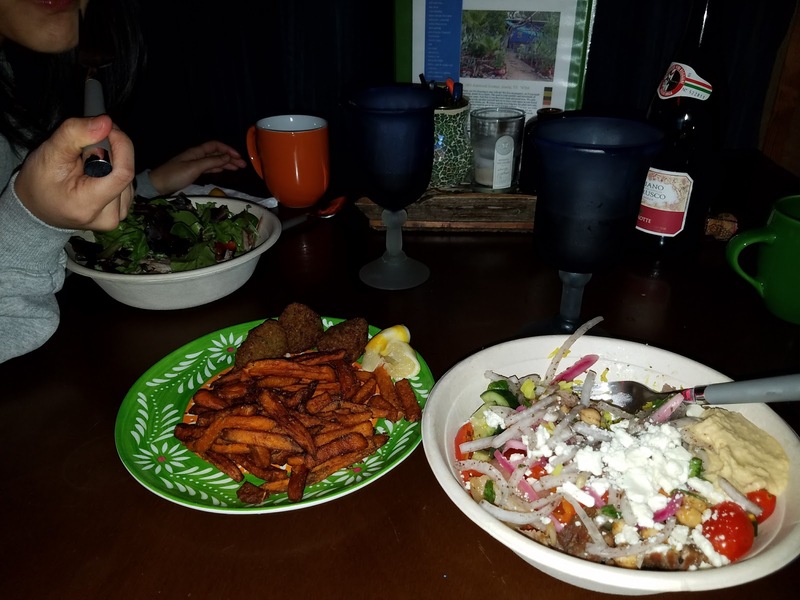 We decided to stop by for a light dinner at Flower Child. Although not an Austin original, it's a great place to get a healthy meal...a rarity when you're on vacation. 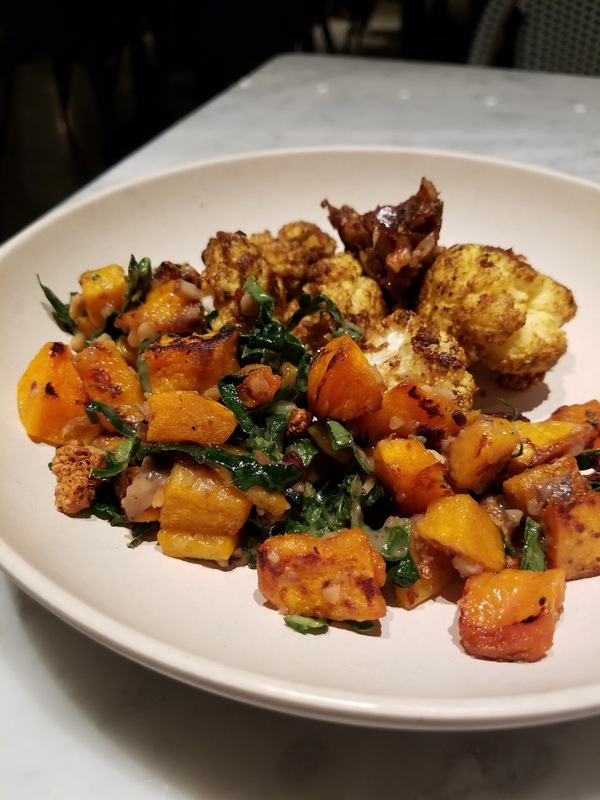 I highly recommend the Indian spiced cauliflower...so tasty! Also, they win cutest bathroom award of the year. 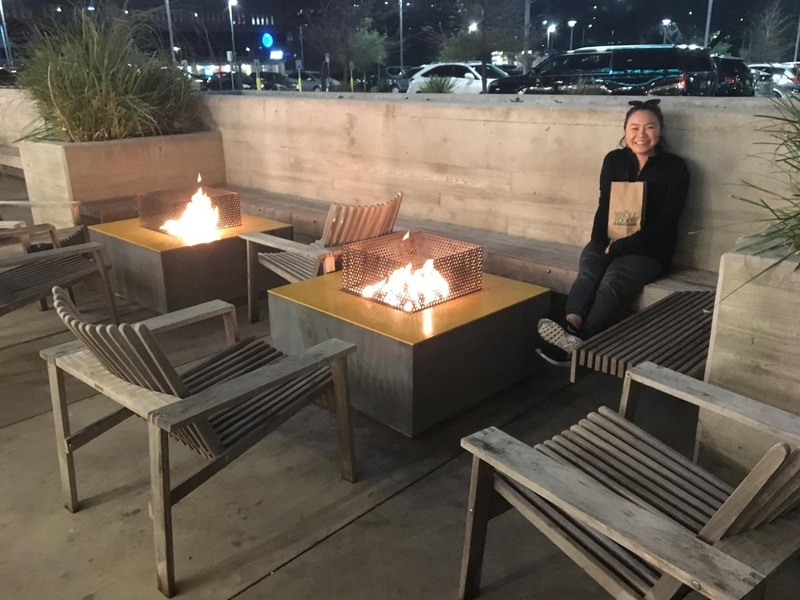 Roaming around a grocery store might not be everyone's cup of tea, but I think stopping by any Whole Foods is well-worth the trip and an adventure in itself since the store originated in Austin. They have lots of fun things around the store like food trucks, outdoor fire pits, an ice-skating rink in the winter and plenty of local food and beauty goodies. You might not think you'll need anything walking in, but I can assure you you'll probably find something in-stores that catches your attention. 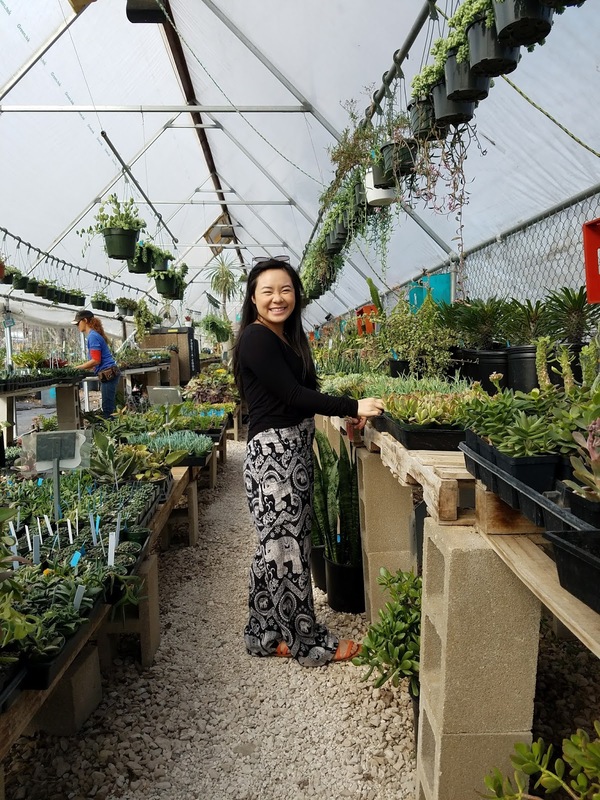 I don't want to spoil the fun by telling you too much about East Austin Succulents, but it really is an oasis for succulent lovers. Steffi was enamored by the agave plants around Austin, so I think she really enjoyed this place. Don't feel obligated to buy anything, but I'm sure you'll want to leave with at least a few little guys in hand. Locals: if you haven't been yet, go now! 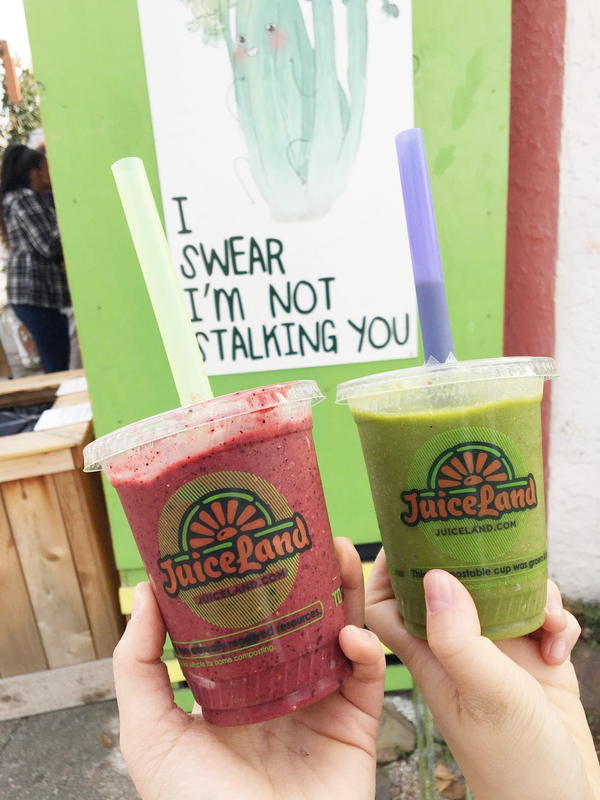 After spending a good while looking at the plants, we stopped by Austin-original juice stand JuiceLand. 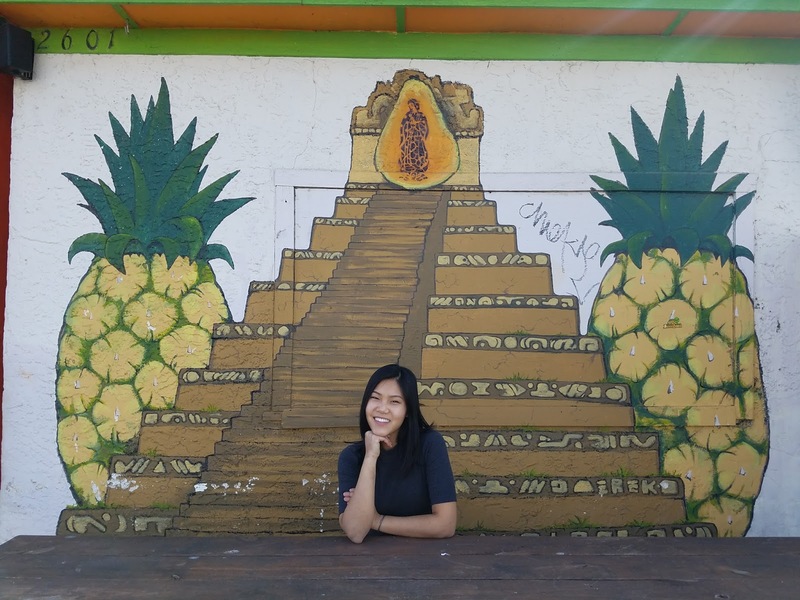 Lots of locations exist in the area, but the one in East Austin is one of my favorites for their fun pineapple wall. 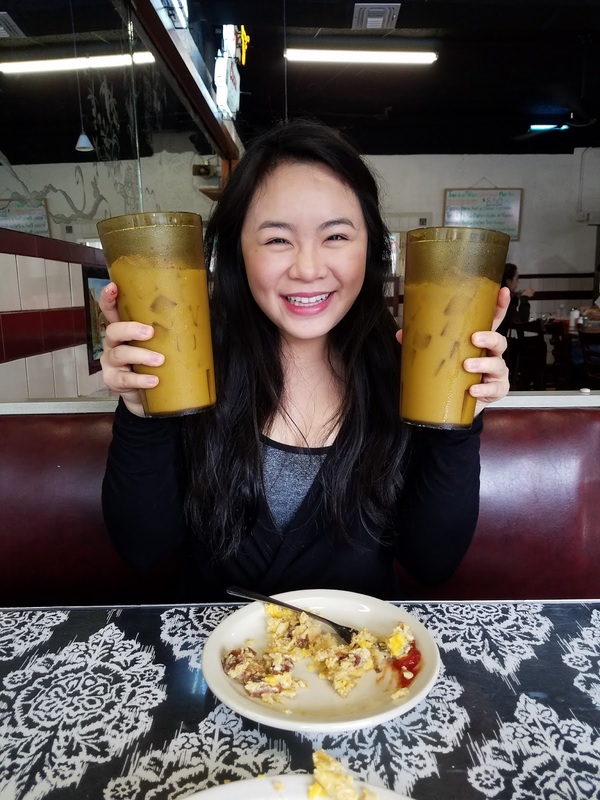 It's hard to go wrong with their menu, but their Peachy Green smoothie is my all-time favorite. 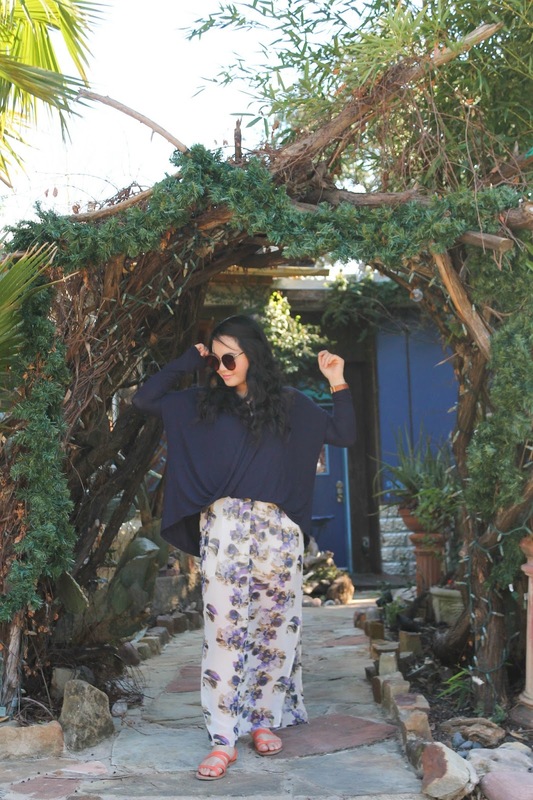 Since we were in the East Austin area, it only made sense to stop by beloved Blue Dahlia. They serve simple, fresh European-inspired dishes using local ingredients and it's a treat when I visit on a slow, weekday morning since the place is usually packed. I also think they've mastered their tartines. Most are under $10 and they're perfectly filling and sharable if you're with a friend that's willing to trade with you. 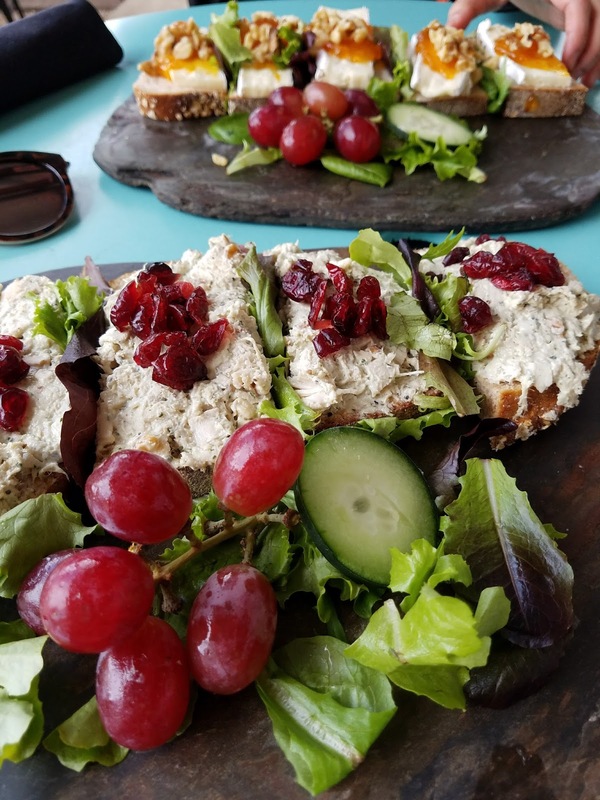 Here we ordered the Blue Dahlia Brie with walnuts and apricot jam and Chicken Salad with dried cranberries and walnuts. I've tried almost all of them and you can't go wrong with any one of them. People are also free to bring their dogs, which makes it all the more fun to sit outside. 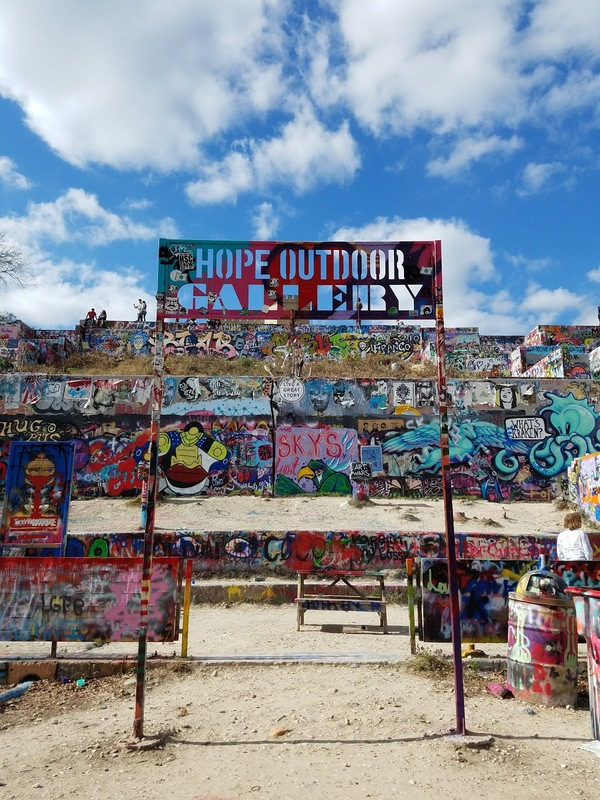 Also known as "Graffiti Park", this place is a hidden gem. It's an ever-changing place of graffiti art with a great view of the city. You can bring your own paint and create your own art or just admire the pieces already there. During our visit, we caught a small group of visitors from Louisiana who worked at a pizzeria. 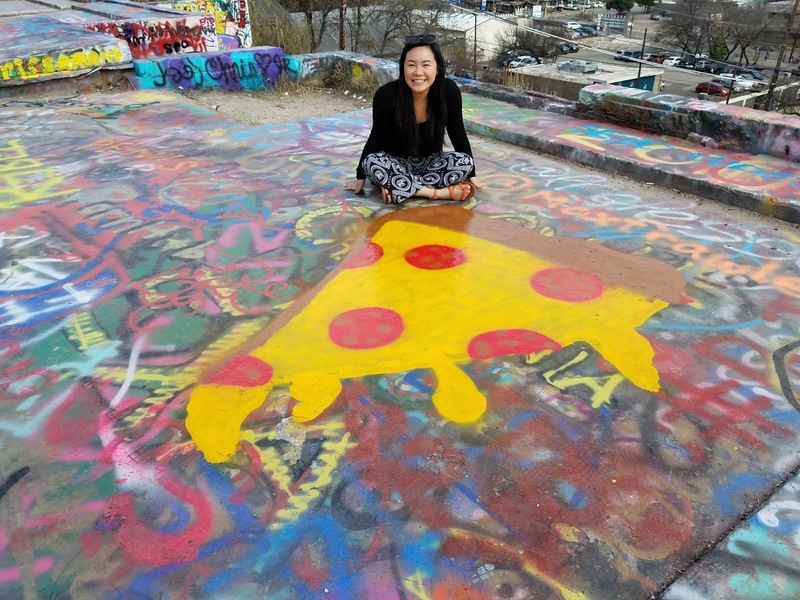 I had to make sure I got a picture with their freshly-painted pizza. Be sure to bring comfortable shoes, so you can climb to the top! 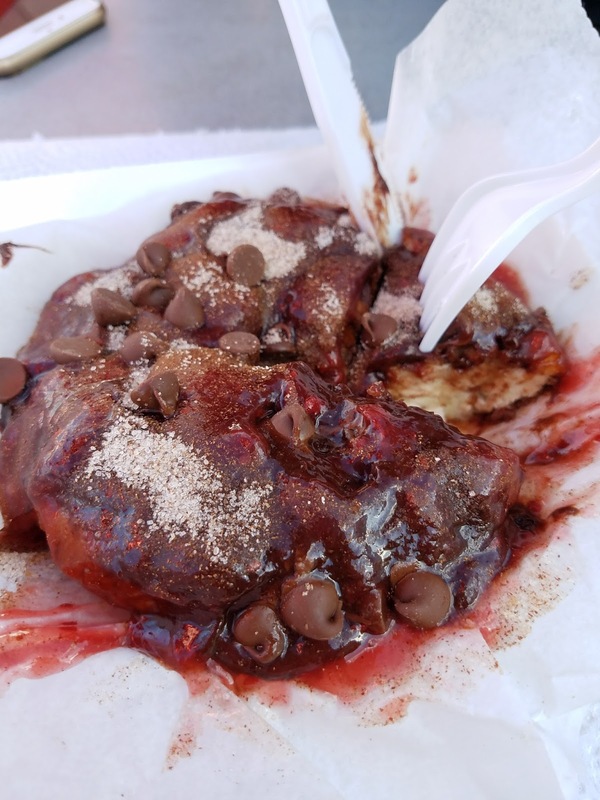 EAT: GOURDOUGHS BIG. FAT. DONUTS. 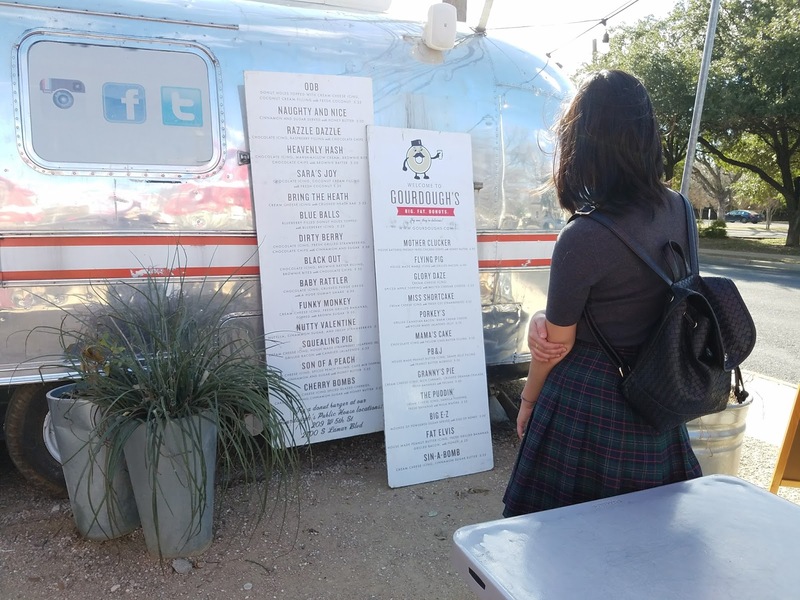 I'm pretty certain Steffi mentioned her love affair with donuts, so I needed to make sure I took her to Gourdough's airstream location in South Austin. We ordered the Razzle Dazzle, and it sure didn't disappoint. The donut was perfectly warm, fluffy on the inside and crispy on the outside. 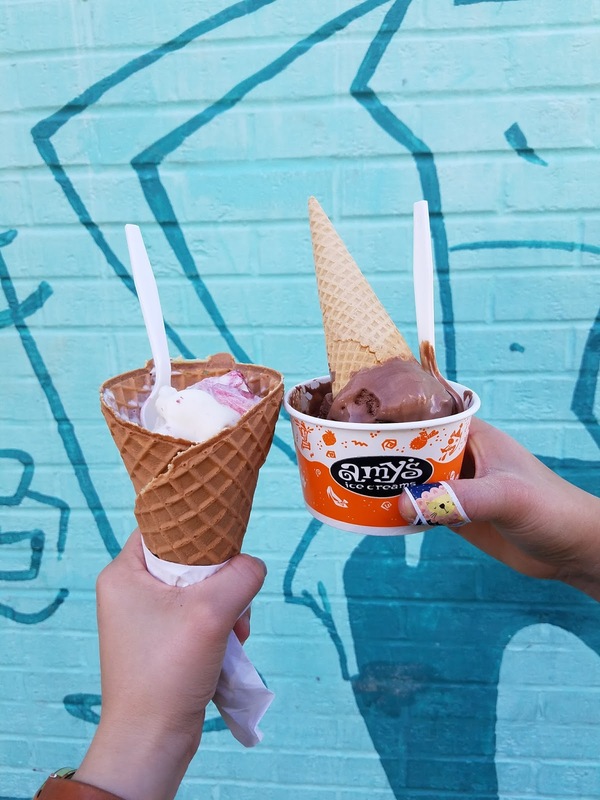 It wasn't too sweet when shared with a friend. There are lots of options on the menu, but I'd 10/10 get that one again. Oh boy, I want one now! After a failed attempt to paddleboard at sunset, we decided to order VERTS in through Favor and take a detour to Hobby Lobby to pick up some craft supplies. It was a simple night in, but I think this was one of my favorite memories of the trip. Nothing like a girls night in crafting, eating, and chatting late into the night. Almost 10 AM and just eating breakfast...whoops. We definitely enjoyed our sleep. 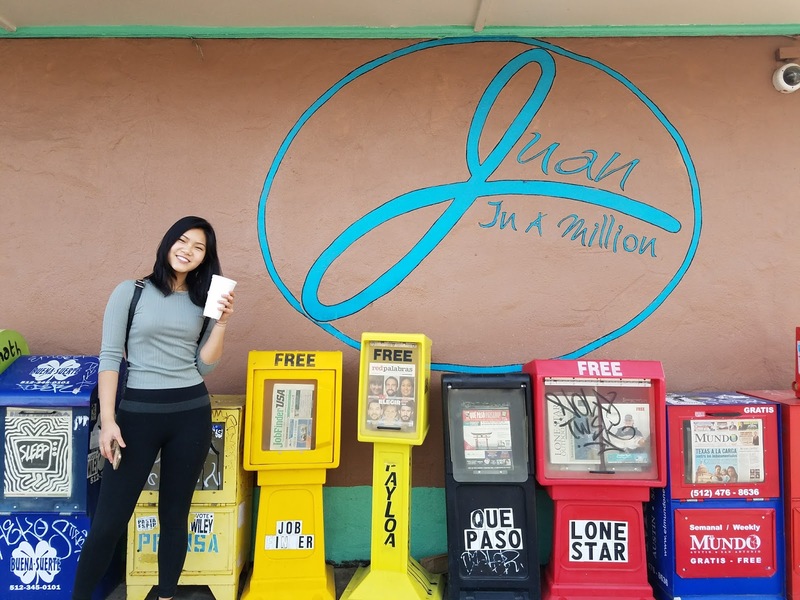 Juan in a Million seemed like a great option for breakfast since we were around the area and breakfast tacos are a staple here. We ordered their famous "Don Juan Taco" plate and split it between the two of us. Cheap, delicious, filling, and yeah...filling. I adore their horchata (delish cinnamon rice milk), so we made sure to order one each. They're Texas-sized for sure! Paddleboarding remains one of my favorite activities in Austin. It's a great activity to enjoy the outdoors and it's more relaxing than most would imagine. 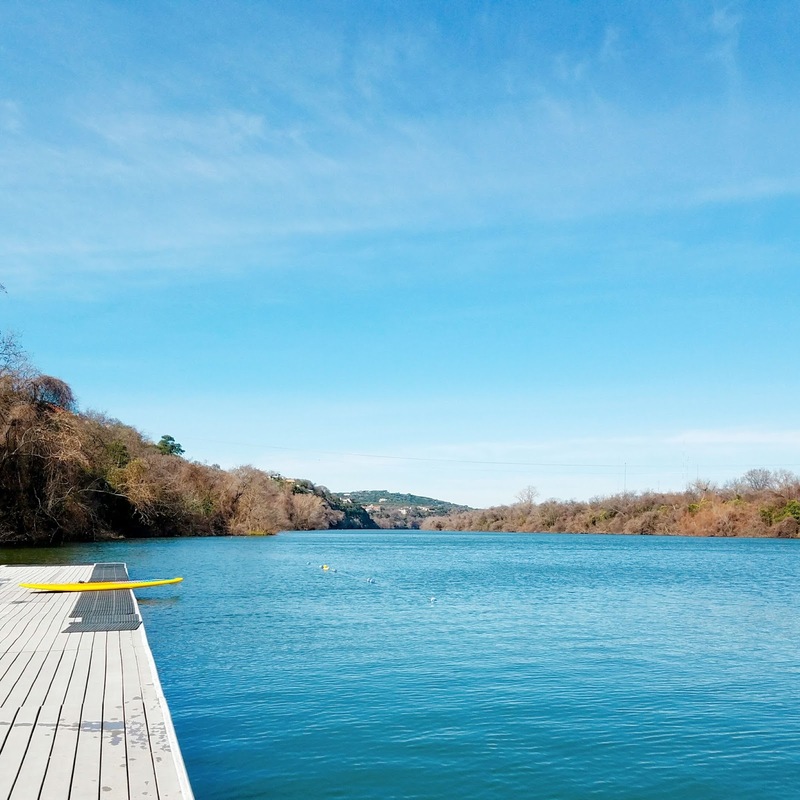 We visited Rowing Dock ATX and it was by far the best paddleboarding experience I've had. They have an incredible dock and they prepared us well to have a smooth paddleboarding experience. We had the entire section of the river to ourselves and it was so peaceful, calm, and relaxing! I recommend going on a weekday morning when it's not too hot and the sun isn't beaming. Also, one hour is also plenty of time! After paddleboarding, we cleaned up and headed to South Congress Street, also known as SoCo! I've talked about SoCo in the evening before, but I haven't been during the day for a while! As a local, I don't come as often as I should, but I always enjoy the fun shops, eats, and photo ops on the street. 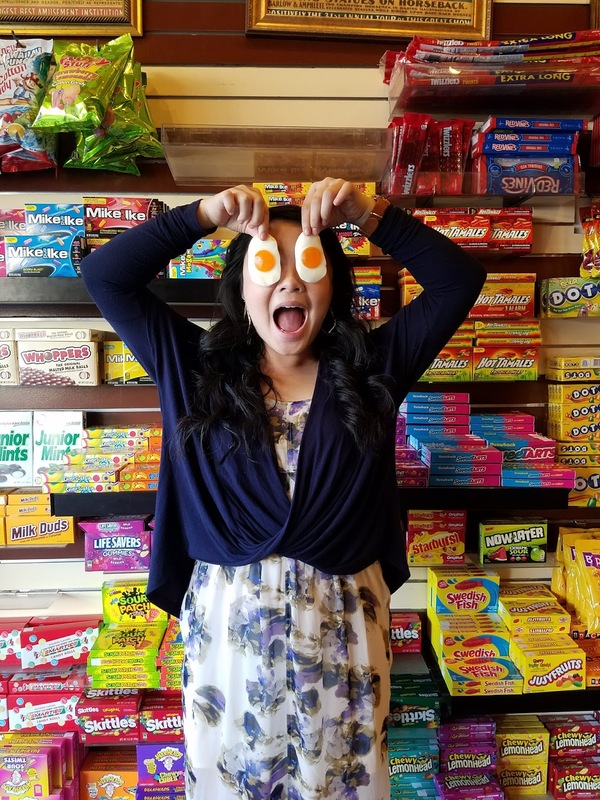 This time, we made sure to stop by the Warby Parker store, Big Top Candy Shop, and the Toms Roasting Co.
Sittin' on a swing at Tom's Roasting Co.
After a bit of walking, we decided to stop by for an ice cream break at Amy's. It must be the nostalgia that keeps bringing me. 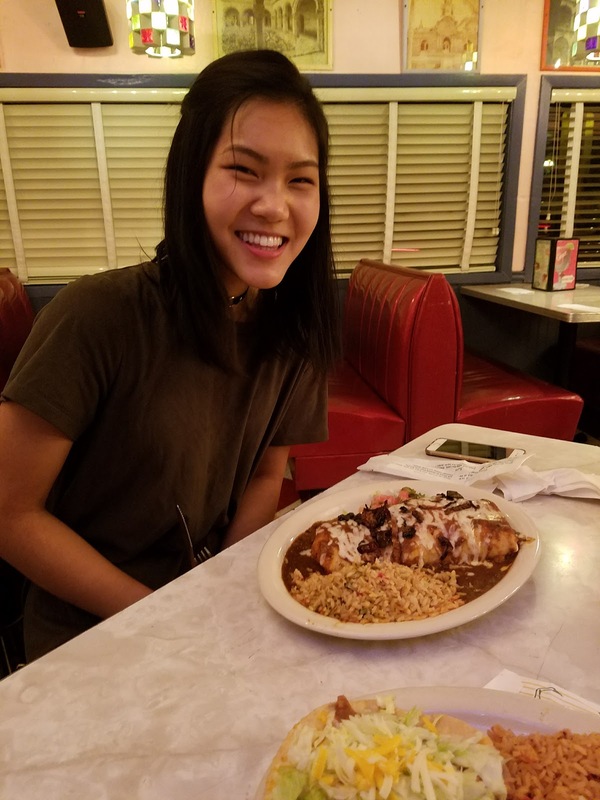 Although the Amy's on 6th Street will always remain my favorite location and I have fond college memories of the Amy's on Guadalupe, any Amy's is good Amy's, especially if there's Mexican Vanilla ice cream with fresh strawberries. YUM! Paddleboarding, South Congress, and now bouldering. We just couldn't get enough! We decided to meet up with another friend and climb away at Austin Bouldering Project. 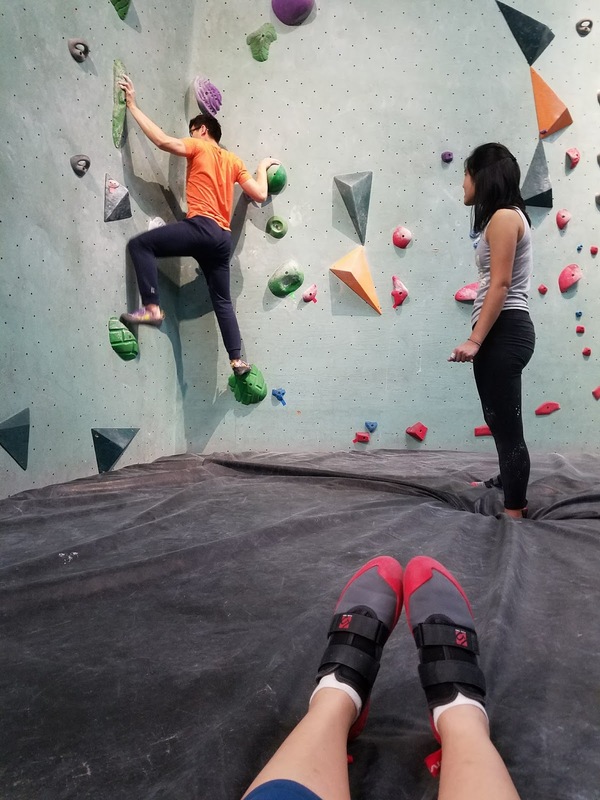 They have a great facility with a fully-stocked locker room, huge weight room, upstairs hangout area, and of course, challenging bouldering courses. I think this place makes for a great indoor, rainy day activity. Plus, there's a discount for students and your shoe rental is free the first time you visit. Steffi and I were starving at this point. Chuy's on Barton Springs sounded like a great option for their huge portions, expansive menu, and eclectic interior. We filled ourselves up pretty quickly and both had to box our food to go. Leftovers for breakfast never hurt anyone! 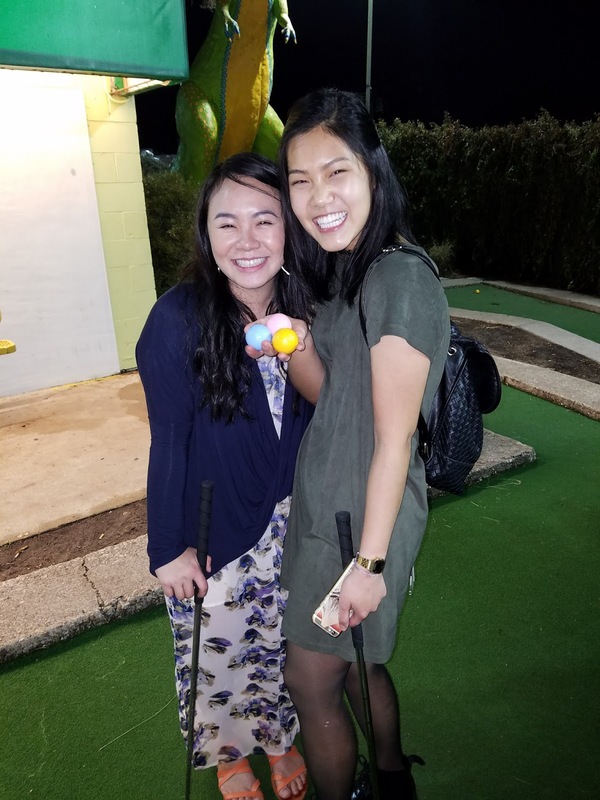 I always have a blast at Peter Pan Mini-Golf and this time was no exception. Maybe we were delirious at this point after all the day's activities, but we sure did have a blast! It's also BYOB, which I'm sure makes the obstacles and surprises even funnier than they already are. Built in 1886, the Driskill is an incredible, historic building located in the heart of downtown. I love their Bakery's chocolate cake, but it was closed by the time we stopped by. I've only ever visited at night, so I think that makes for the fun experience, since people also say this place is haunted. It's really fun sitting on one of their comfortable couches and imagining what life was like back in the 19th century. After so many activities packed in just a matter of days, we were pooped! I definitely wish we had the time to do more fun activities and eat more yummy food, but I guess that just means there has to be a next time, right?! Due to packing, moving back to Austin for the semester, and getting used to my new schedule, I've been away for almost a month! I'm ready to get back into the swing of things again here on THe Bella Insider, so be sure to check back soon for another new post. Thanks so much for stopping by today, friends. See you very soon! LOVE it! Juan in a Million's Don Juan and the horchata are my go-to also! The horchata at Juan in a million is so delish. I'm craving some now! Thanks for stopping by, Anita! This is such a fun post, Sarah!! 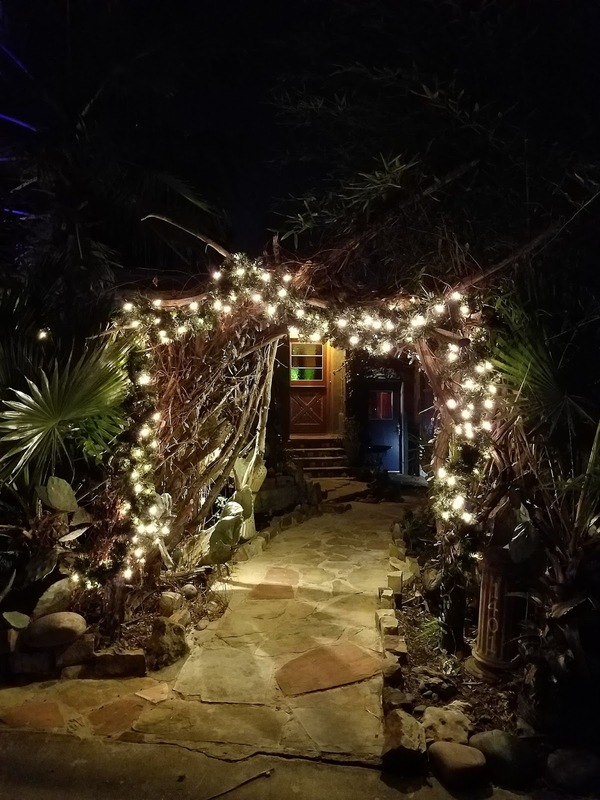 LOVE every place you picked for food and that Airbnb looks insanely amazing!! I'm so glad you enjoyed it, Molly! I think you would adore this place. 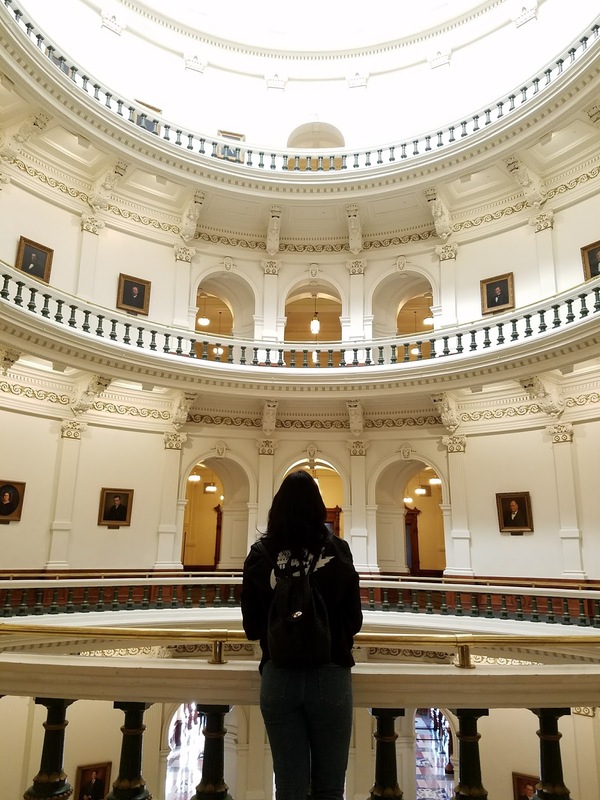 Hope you can come to Austin soon!